Chouix is a pretty six and-one half year old Siberian Husky/German Shepherd/Chow mix that actually came into MaPaw SHR at two days old. She was born on November 20, 2003. She was an adorable puppy and she has grown into a beautiful adult. Chouix was adopted to a wonderful family at 10 weeks old and has been a cherished pet and member of their family all her life. Sadly, due to life changes, her family has no other recourse but to ask us to find their girl a new home where she will be loved. Chouix has always been a MaPaw favorite (even though we love ALL of our dogs). She is a very loyal and friendly dog, however, she can be a little shy at times out of fear or if she feels threatened for some reason. She has been raised with kids in the house ever since she was a puppy. Chouix just wants to please no matter what; she is a loving girl who is an excellent companion and soul-mate. 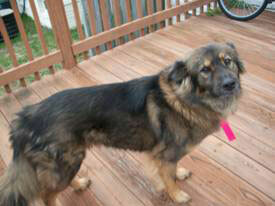 She will be best in a home with another dog to keep her company as she can be a little anxious when left alone. Chouix just needs a home where she will be safe and loved ~ and where she can do what she does best ~ give unconditional love and be by your side.